In the last episode of For the Love of Teaching, I spoke with Ceri Edwards about the amazing passion she has for teaching, and the support network she relies upon to keep her focused! This week, Ceri tells me all about her newfound passion: being a healthy teacher. Not only is Ceri doing her best to become healthier and happier herself, she’s also inspiring and encouraging thousands of teachers to do the same. Along with her friend Georgia, she’s formed a positive and vibrant community that they call Healthy Teachers Aus. Listen to Ceri speak about why she decided to make the change, how much weight she’s already lost, and all of the other amazing benefits of her healthy lifestyle she’s discovering along the way! Intro: Welcome to the Teach Starter podcast, For the Love of Teaching. Join us as we chat to inspirational everyday teachers. It’s real, it’s uplifting, it’s funny. It’s For the Love of Teaching. Here’s today’s host, Bronwyn Brady. 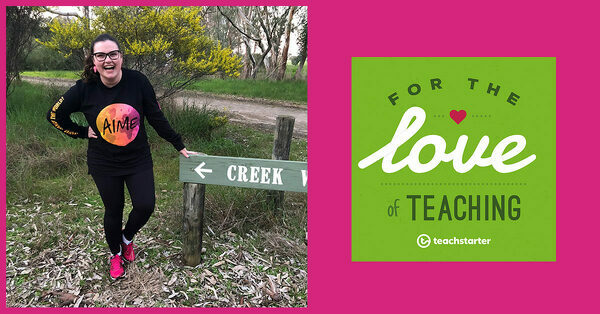 Bronwyn: Last week we chatted with the inspiring, hilarious rural teacher, Ceri Edwards, about her job, her teacher tribe and the network of support she uses to be her best teacher. You have just started a new sort of journey on Instagram. Ceri: So this started in term four last year and I think the person that really began the whole journey was Georgia from Teach, Tea, Type. And it was just with a simple Instagram post. She was like, “Does anyone want to make a change in term four?” And I was kind of sitting on my little phone like, I do want to make a change. And one of my biggest reasons for making that change was I’ve put on 25 kilos since I started teaching. All of those staff room, little snacks and lots of ignoring the voice in the back of my head that goes you don’t need that Double Whopper cheeseburger or whatever it is. And so she put out that call and a couple of people were interested and then a couple more, and then she started a Facebook group and I was so inspired, I was like, yes, this is what I need. Ceri: And I think the pinnacle moment for me was knowing that I had all of these other people who were going, yeah, I really need to make the change as well. And when you have all of those people behind you, you feel a little stronger in your self-control. And so I started on the spot and my partner’s already so … He runs every day. He’s that guy who goes for a six kilometer run. And I’m like, I just woke up. What are you doing? But I said to him, I’m going to walk Dahlia every day this week. I’m going to hit 10,000 steps every day. I’m going to … and I just started making these little, little changes. And then I started … I was so excited. We were on a road trip, I’m pretty sure. And I went, I’m going to create another Instagram and I’m going to call it Healthy Teachers Aus. Ceri: And Georgia had started a Teach, Tea, Type health group and I said to her, I hope it’s okay. I want to use your momentum and I want us to start sharing teachers around Australia or even around the world, now we have 4,000 or four and a half thousand and people send me up to 20 different stories a day of different teachers of just them exercising or making healthy choices. And I’m like boom reshare, reshare, reshare, reshare. And then all these people are joining because they’re going, oh, I’m so inspired to get out there and go swimming because I can see Hannah in Western Australia is … she’s joined a swim team. So that’s what I’m going to do. I can see that Rhiannon in Northern Territory’s taking her dog for a walk. So I’m going to take my dog for a walk. Ceri: It’s that support once again from Instagram that is pushing us all to make changes. And I’ve lost seven kilos. Ceri: It was like boom, boom, boom every time I checked it, not that it’s all about the weight. I was coming to work and I’m already a pretty positive person, but my boss said I was leaving with more energy. So I used to leave pretty drained and then I would go home and I’d have a pack of chips and I’d sit on the couch and I’d watch Netflix. But instead of doing that, I was making the conscious decision, I’m going to go for a walk even if I don’t want to, I’m going to put on my joggers and I’m going to put on my sweet Active Truth tights. They’re so good. They can fit my phone in them, so I love them. Ceri: I’m going to talk about … I bought six pairs straight away. I was like “Will, I’m buying six because I’m making a change!”, And I go for a walk for an hour to two hours and it’s almost mindfulness. You’re taking that moment to just have a break from everything and listen to music and appreciate nature and it’s lovely. Bronwyn: And spend time with your Dahlia. Ceri: And spend time with Dahlia and she looks up at me like this change is great. She’s loving it, I’m loving it. Yeah, it’s made a big impact. Bronwyn: … because you know, it’s a side thing, but it’s also … It does matter. Bronwyn: And teachers I think often neglect looking after themselves. Ceri: Oh for sure. They put everyone in front of themselves. Bronwyn: Exactly. And it’s quite specific to our profession that you leave school, you go home, you feed yourself and you continue working. So it’s good to switch off sometimes and remind yourself. Ceri: And not feel guilty about it. Bronwyn: Yeah. You don’t have to just jump straight back into it. Ceri: And I think as well, like in terms of the Healthy Teachers Oz, which is now the Facebook group as well, telling people it’s okay to do this. This is a good thing. We’re all doing it. We’re making this change, we’re not feeling guilty about it. You can do it as well. Ceri: And you’re gonna feel better and showing people, I went for a … So many people live on the coast and they show me beautiful photos of them walking along the beach. And I’m like, thanks guys, I don’t have that, but I’m inspired nonetheless. And so many people send me photos of their devices, so like Garmin, Apple, Fitbit, whatever it is. And there was … Oh, there was this app called Stridekick and we were sharing this code and Rose, who is a teacher up in the Northern Territory, she found it so that we could all connect and I’m pretty sure that we broke the app in terms of … I don’t think the developers were expecting 500 teachers to be competing against each other for steps. Yeah. And so the app was like, you can no longer have more than a hundred people and it’s because we were all so excited to compete in a friendly competition against each other that I think they weren’t ready for that. Bronwyn: It sort of snowballed into something. Ceri: Yeah. Updating each other on the steps that you’ve done, I think it pushes you to do a little bit more. There was one point where I … We were driving 16 hours back from Sydney and I said, pull over. I’ve got to get my step goal up and Will and I just ran up and down the side of the road for 20 minutes so that I could reach my step goal. So, yeah. Ceri: And it’s spread to the kids as well. We had a Fruity Friday party at the end of term and all of the parents came in and said, my child just keeps asking me for fruit and for healthy choices for lunch. And it was impacting them as well. They were seeing the benefit of the healthy changes. Bronwyn: Fruity Friday, I really love that, really cute. Ceri: Yeah. No chips allowed. Bronwyn: No Party Day! Fruity Friday. Ceri: Because I tell the kids my favorite drink is water and they’re like, no, really? And I’m like, water is the best. It is so good. It’s so refreshing. It is my favorite drink of all time. Coffee second, water first. Bronwyn: Oh, gosh. Water is a great drink. It’s the original drink, the OG drink. So it’s been so great seeing you on that journey and the happiness that you have is infectious and it comes across your Instagram stories. Don’t get me wrong, I love seeing your beautiful feed. Your stories are really where it’s at for me. Ceri: Yeah, I get a lot of really nice messages as well from people just saying … I was telling you earlier, just someone saying, Oh, you know, I’m going to send you some happy mail because you make my day every day. And knowing that I could have that like it’s going to make me tear up. Bronwyn: Don’t, we don’t have any tissues in here. Ceri: It’s lovely that me just being myself and sharing me being a giant dork, it can positively impact someone’s day. Bronwyn: Oh, that’s awesome. And I think that being a giant dork is good because from one giant dork another, like literally giant, it is good because it shows kids that no one’s perfect. It’s not only great for other adults to see that on your Instagram, but in your classroom, it’s showing the students that we’re all imperfect. We all have imperfections. Teachers are real people. Bronwyn: We say funny things and sometimes things pop out from nowhere. Ceri: And a productive classroom doesn’t need to be a silent classroom. I’m a really big believer in that. If all the kids in the classroom are laughing, they can still be learning because I use jokes to get them on board with learning and it works. Bronwyn: You’ve got to have a sense of humour. Ceri: If you want to make up a song in the middle of class, it’s like, put your name on your paper. I’ll just start singing it and they’ll be like strange, but now I’m going to put my name on my paper. So be weird and do whatever you want. Ceri: I remembered one of the funniest moments of teaching. Ceri: And it was … We were doing a drama game and I told a boy, like I show them a card and I said, you have to be a wrestler. And he comes on for bus stop and he’s looking at me kind of like, how far can I go with this? And I was like, take a risk, do it, do it, do it. And so he grabs the other kid and then they like roly poly down and his pants ripped in half in front of all of the kids in the room. And I was like, this can go one of two ways, that boy’s going to cry or that boy going to laugh. And I was stopping myself from laughing even though this was the most, that comical rip. And then his underwear and I was like, ah. And he ended up laughing and going, well lucky I brought my footy shorts in today. And I just … I cried with laughter. It was the funniest thing. Bronwyn: The suspense. Lucky he wore undies that day because you know boys, they sometimes don’t. They sometimes forget. I’ve had students at swimming, it’s been swimming day and they’ve forgotten their spare jocks! Ceri: That poor girl in the front row. Bronwyn: He was probably so relieved! Oh that’s a great one. So I’ve learned a lot about you by stalking your Instagram. I feel like we’ve been doing some reciprocal stalking. Bronwyn: We do have another thing in common, which is our beautiful little border collies with grown up women names because I’ve got Ruby and you’ve got Dahlia. Ceri: Oh Ruby and Dahlia. Ceri: Do you know the story behind her name? Bronwyn: I want to know it. Ceri: Okay. So I was going to call her Bella. I was going to call her a name that I’d loved when I learned Italian and it meant beautiful. And then I looked at her and I was like, oh, she’s not a Bella. And I had this internal panic. I say to my dad, what am I going to call her? And he said, you know what, who are your favorite authors? And I say C.S. Lewis and Roald Dahl. And I said, oh, Louis. And I looked at her and I was like, she’s not a Louis. And then I said Dahlia, Dahlia. And it just … beautiful natural thing that happened. And I looked at her and I was like I get it has a lot of syllables in it, Dahlia, but I loved it. Ceri: She looks like a Dahlia and what a dog. Bronwyn: That sounds … What a dog. Ceri: What a shining star in my life. Bronwyn: She is a beauty and I love watching your Instagram stories when you show her little tiny teeth. Ceri: She has smaller teeth than any other dog I know. She struggles to eat things and so in some ways it’s probably not good for her, but then it’s like … She just looks at you like … And it’s the funniest thing. I would just sit there and laugh at her. Like I film sometimes, but I’m laughing at that a lot, like many, many more times. Bronwyn: And you can hear your giggle because she brings you so much joy and teachers need joy in their lives and you can just tell that Dahlia is something that gives you joy. Bronwyn: Is someone who gives you joy. Bronwyn: Yeah, it like a plop. It’s more like a plop. Ceri: And she just sits there, lies, stares at me and goes, how’s your day been? That’s what she says to their eyes, I think. Ceri: She’s amazing. She’s the most intuitive dog. You know those dogs are look at you and they just share their love and their warmth and she’s that and I wasn’t sure if anyone would pick up on it, but I get … She has like a fan club. I get messages about her daily of people going, I don’t have a dog. I’ve always wanted a dog. I love your dog. And yeah, everyone loves her as much as I do. Bronwyn: Also border collies are the best dogs. Ceri: They are, not because I was going to do a dog podcast. I don’t know if you know this. Ceri: I bought a microphone and was like I’m doing a podcast on dogs. I’m going to teach the whole world about dogs and my first episode that I did research on, this never eventuated by the way. This was a year ago when I was relief teaching and off thinking of things that I could do to keep myself busy. And I researched all of these facts on dogs and border collies are the most intelligent dog in the world. Number one. Ceri: I think poodles are second, which is a surprise. Bronwyn: Poodles, I’ve heard are very rude and not good with children because I did a little bit of research but border collies are just beautiful. Ceri: They’re amazing. And she’s cross Kelpie, which is my … Kelpie’s my third favorite breed. Second is golden retriever. Fourth, I can’t remember. Bronwyn: I do love myself a beagle though. Super cute. Ceri: A beagle because of the ears? Bronwyn: Yeah, they’re just so cute. And actually you did post a picture of a little dog the other day from a working dog rescue place and I screenshotted it and sent it to my husband and with a little face and he said, no. Ceri: I say to Will, should we get another dog? And he’s like, you couldn’t … You don’t have enough love. You give all your love to Dahlia. This other dog will get neglected. Bronwyn: Seeing a lot of parallels between dogs and children. The naming challenges when you look at the face and it doesn’t look like a Bella, that happens with kids a lot too with children. The sibling love, do you know what? Bronwyn: I heard Dr. Phil say this. I think you should get another dog. He said, you don’t need to spend your love bank account. You don’t need to spend the same love from one bank account. When you have a second baby or a second dog, you just open a new love bank account. Ceri: That’s Dr. Phil, what a man. Thank you for the advice. I feel like I’m on the couch with Dr. Phil. Bronwyn: I invoked him. Okay. So I’ve been … We’ve been communicating a little bit on email and I did know how to pronounce your name, which I’m super proud of because sometimes in the digital space you read someone’s name so many times, you don’t know how to say it. Ceri: All the time. Yes. Bronwyn: Yes, but I knew you were a Ceri because from one girl with a weird, hard to say, hard to spell Welsh name to another.This happens a lot to me. So I … People call me Brownen, they write Brown. Ceri: Cherry bomb. A lot of people have asked me, is your name Carrie-Ann or is it short for Ceridwen, which is the longer Welsh. And I’m like, no, no, it’s just Ceri. Bronwyn: It’s a beautiful name. Ceri: I love it. It actually … it means love. Ceri: Which I love. I love that it means love. Ceri: Yeah, I always knew when teachers that I had were about to say my name because they’d take a breath. Bronwyn: Especially as a relief teacher. It’s just a can of worms. Ceri: And so they’d look at it and I’d save them because I’d know, oh this is awkward. And I go, it’s Ceri. And they’d always go, right Ceri. So they were actually up to my name. Bronwyn: And they say it like … The ones that do attempt it, they’re like, I’m going on a whim here. Ceri: They always go Se. It’s always Se. Bronwyn: Ceri, that’s what I was going to say. Ceri: No, I love having a unique name and I think it’s cool and I love when I meet kids who have unique names as well because we bond over. You got stuck with this. I got stuck with this and I like to see how kids take it, whether they resent it or whether they change it. Bronwyn: I’m just a burning ball of resentment. Ceri: I’m an embracer. I embrace it and I run with it and I’m like this is me. Ceri: This is me, greatest showman. Bronwyn: Give us a chain. You know you want to. Ceri: I’ll save that. So it’s a story. Bronwyn: Well we gave our daughter … we gave all our boys really normal names, normal traditional names. Then we went crazy with our girl and we called her Blair, which is a Scottish name and ode to our heritage, but we put an E on the end just to add, just to confuse people. Ceri: Ah, mixing it up. I like it. Ceri: How could you get Blair wrong? Bronwyn: And they said, oh no, that’s not her. She’s looking in the boy pile and I said no, that’s definitely her. Yeah, she’s … yeah. Always resent and then I pass that on to the next generation. Ceri: Yeah, I’ve got … I’ve already got names in mind. Bronwyn: I wasn’t sure. I wasn’t sure. Ceri: I could see where that was leading. Bronwyn: Potential fur babies. Oh, does Dahlia have a middle name? Ceri: No, no. She doesn’t really have a last name because who could choose? Bronwyn: It’s your last name. Ceri: She’s … Even though I got her at eight weeks and it was just as my partner and I were getting to know each other. So he’s been in her life the whole time. Ceri: So we have her together and he calls her our dog and I love that. Bronwyn: That’s perfect. My dog does have a first, middle and last name. Bronwyn: Ruby Rose last name. Bronwyn: Yeah. Oh well, it’s been so gorgeous talking to you and thank you so much for coming into the office today. Ceri: Thank you. Thanks for having me. Thanks for making me feel comfortable as well. Bronwyn: Oh, no worries. It’s been a pleasure. Yeah. All the best. All the best with Healthy Teachers Aus and with Our Creative Classroom. Ceri: If you want that encouragement to make some changes and you’re a teacher who wants to be healthier, definitely jump on board Healthy Teachers Aus. And if you want ideas and lip syncing, then follow Our Creative Classroom. Bronwyn: Perfect. Thank you so much Ceri with a C. Good on you. Awesome. Thanks for joining us today on For the Love of Teaching where we chatted with Ceri Edwards. We look forward to seeing you next week when we talk to another real inspiring teacher.